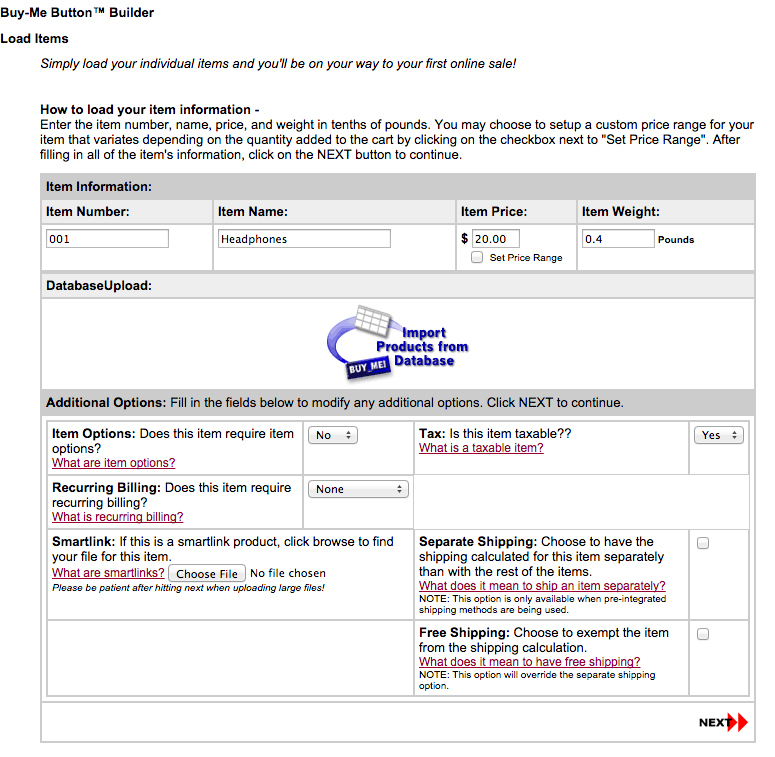 This article outlines how to create, edit and delete Buy-Me Buttons. 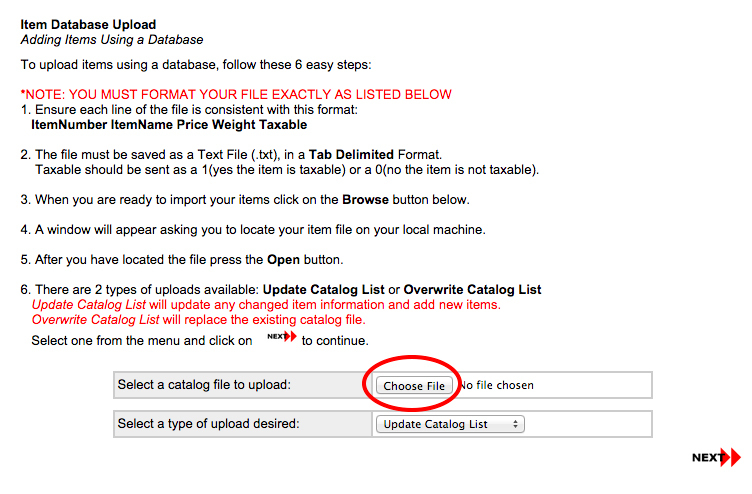 You have the ability to either add each item individually or use a database upload to bring in multiple items at once. Weight: The weight of the item, for shipping purposes. This number is in pounds, and may include a decimal point. Taxable: Whether the item is taxable or not. Enter 1 if the item is taxable and 0 if it is not. Above is a sample file created for a Database Upload. Use your word processor's Save As function to save the text file (.txt) in a Tab Delimited Format. In the Management Console next to Select a catalog file to upload, click Choose File and navigate to the product file you created. Click Open. On the next screen, the results of your upload will appear. If successful, your products will have been imported. If there was an error, this screen will display the line number and details of any errors. If you have errors, correct your file and repeat steps 4-6 until successful. If the item has item options, select Yes in the dropdown box next to Item Options. Item Options are variations of an item, such as tshirt size or color. 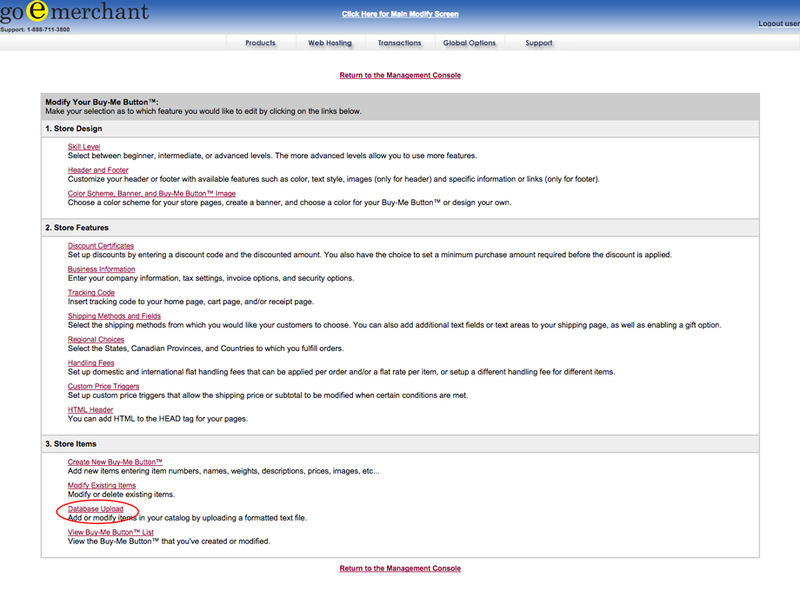 If the item is a downloadable file, click Choose File and browse your computer for your file in the Smartlink section. 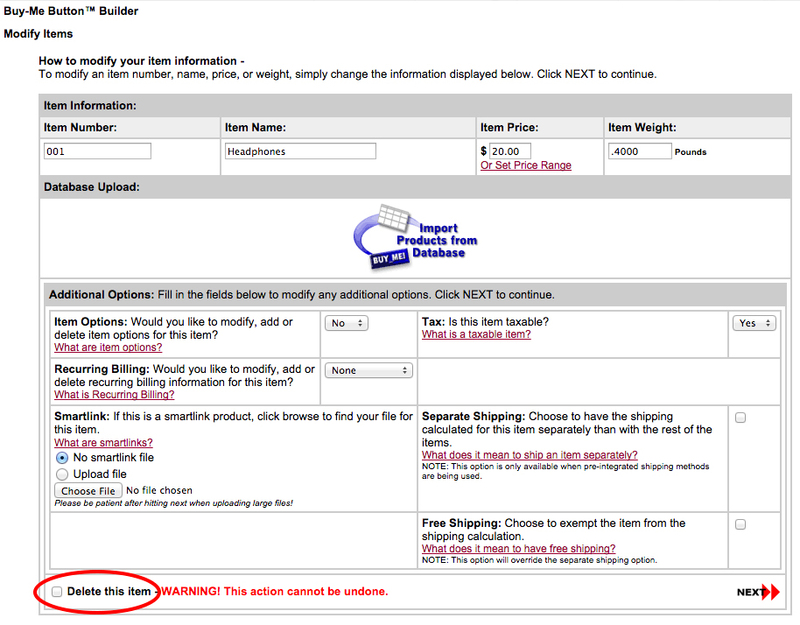 If the item's shipping should be calculated separately from other items, check the box next to Separate Shipping. If Inventory is enabled on your store, you will be prompted to enter the quantity of the product on hand. Enter the number in the Quantity textbox, and click Next. Your item has been added. Search for the item you wish to edit. You can check the box next to 'Check here to display all items' if you'd like to view a list of all items to select from, or you may enter the item number in the textbox provided. The dropdown box allows you to change the search type to Contains, Begins With, Ends With, and Exact Match. These all correspond to the value of the Item Number box. If you chose to display all items, there will be a pulldown menu containing a list of all Buy-Me Button products. Select the one you wish to edit and click Next. The next screen will display all of the item properties. Make the necessary changes and click Next. If you'd like to delete a Buy-Me Button, follow the steps below. Please note that this cannot be undone. Search for the item you wish to delete. You can check the box next to 'Check here to display all items' if you'd like to view a list of all items to select from, or you may enter the item number in the textbox provided. The dropdown box allows you to change the search type to Contains, Begins With, Ends With, and Exact Match. These all correspond to the value of the Item Number box. If you chose to display all items, there will be a pulldown menu containing a list of all Buy-Me Button products. Select the one you wish to delete and click Next. At the bottom of the page, you will see a checkbox next to 'Delete this item - WARNING! This action cannot be undone'. Click the checkbox. Article written by Gera W.